I know I briefly touched upon Rapid Rewards Dining in a previous post. Today, I want to focus completely on maximizing benefits when eating out. Not all restaurants or bars participate in Rapid Rewards dining, but you can do a search by local city, restaurant name, cuisine type, price range, and more. 5-10 days after you dine at a participating restaurant, you will automatically earn points on your account. The standard rate of earning points is 3 points per $1 spent on your linked credit card. This does not affect the normal points that you would earn at restaurants for your credit card purchases. You also earn 10 points for completing a restaurant or bar review after every experience. 1. New user bonus: 300 points after first purchase of at least $25. This is on top of the 3 points per dollar that you’d be earning standard. TIP: don't sign up for the Rapid Rewards dining program until you've searched and planned out your first restaurant. You have 60 days after registering the program to earn these 300 bonus points. 2. Get Ahead Bonus: after you spend combined $75 at program restaurants before 4/13/12, you will earn an extra 2 bonus points per dollar spent. That’s 5 points per $1 just to eat out. This promotion ends on 5/15/12. 3. First step Bonus: once your account reaches 1500 points, you’ll receive free 500 bonus points. 4. Thank you Bonus: after you achieve your First Step Bonus, every time you earn 1,000 points normally just by dining and completing reviews, you’ll earn an extra 300 bonus points as a reward. No need to register, it’s automatic every time. I first heard about Rapid Rewards Dining about 1 month ago, and that’s when I signed up. I never got a chance to eat at a participating restaurant. Today we were really craving Shabu Shabu, a Japanese type of hot pot cuisine. 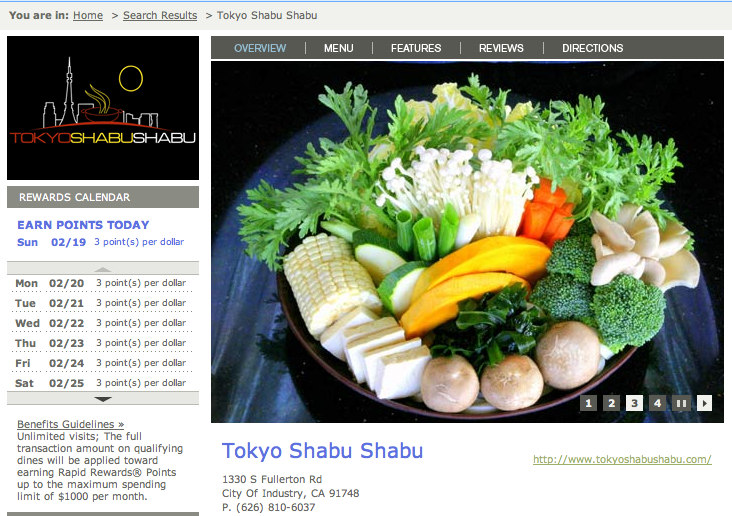 I went to the Rapid Rewards Dining website, typed in my zip code “92821” and “shabu” and there popped up the closest restaurant: Tokyo Shabu Shabu. We remembered to check in on both our yelp and foursquare apps. Just by checking in, we were able to get 2 free iced lemon teas ($2.49 each) and 2 free green tea ice creams ($1.99 each). By taking 3 seconds to use yelp and four square, we were able to save $8.96 + tax off our bill. Total tab after tax and tip came out to be $44. By charging $44 to my Chase Sapphire Preferred card, I earned 88 Ultimate Rewards points. ($44 x 2 points per $1 spent dining). The Ultimate Rewards points convert 1:1 into Southwest Rapid Rewards points. By linking my credit card to Rapid Rewards Dining, I earned 132 base points (3 points per $1 spent = $44 x 3 = 132. I also earned the welcome bonus of 300 bonus points after spending $25 at a participating restaurant. I will also earn 10 bonus points after completing my restaurant review. 88 + 132 + 300 + 10 = 530 Rapid Rewards points! To top it off, this restaurant has a loyalty customer service stamp card. We got 2 stamps for the meal. 4 more visits here together (1 meal per person), and we get a free meal! One could argue that if you’re not eating out, then you’re saving more money, which is true. I enjoy eating out on the weekends and special occasions; it helps to keep me sane. If you’re going to be spending money when you eat out, be sure to maximize your rewards if possible.